An audience of close to 700 jurists, attorneys and business and community leaders were on hand at the Denver Marriott City Center October 20 for the Colorado Judicial Institute’s annual Judicial Excellence for Colorado Dinner. 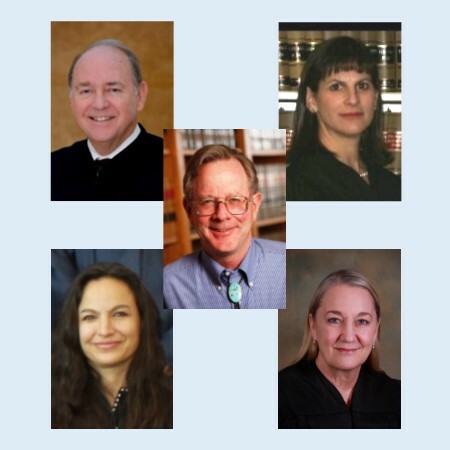 At this year’s event CJI’s Judicial Excellence Awards were presented to three outstanding jurists, including Boulder County Magistrate Kristina B. Hansson, Denver County Judge Clarisse Gonzales Mangnall and 18th Judicial District Judge Angela R. Arkin. Additionally, CJI presented Distinguished Judicial Leadership Awards to James S. Casebolt, a retired judge who served 21 years on the Colorado Court of Appeals and Gregory J. Hobbs, Jr., who recently retired from his nineteen-year tenure as an associate justice on the Colorado Supreme Court. Keynote speaker, Ellen L. Weintraub, is a member of the United States Federal Election Commission (FEC) who has twice served as Chair of the Commission. Weintraub congratulated Coloradans “for maintaining the integrity of your judicial system” with the state’s 49 year-old system of selecting judges on merit rather than through partisan elections. But the Commissioner decried the fact that Citizens United and other rulings have given rise to the creation of “SuperPACS” that often don’t have to disclose their donors and this has opened the floodgates to unaccountable cash in politics. Weintraub noted that this had had a negative effect on our political system, with a recent New York Times poll showing that 84 percent of Americans believe money has too much influence in politics and 85 percent saying that the current system of funding campaigns should be completely replaced. And the last election saw the lowest voter turnout in 70 years. “Never have so few given so much to acquire so much influence,” she added. Magistrate Kristina B. Hansson, Boulder County 20th Judicial District. A 1980 Golden Gate University School of Law graduate, Magistrate Hansson was appointed to the Boulder County and District Court in 1995 after a career as an associate with the law firm of Gorsuch Kirgis, LLC and a deputy City Attorney for Lakewood. Her busy docket includes county court traffic and misdemeanor arraignments, protection orders, adoptions, sealing of criminal records, and weekend jail coverage. Judge Clarisse Gonzales Mangnall, Denver County, 2nd Judicial District. A 1992 Howard University School of Law graduate, Judge Gonzales Mangnall was appointed to the Denver County Court bench in 2007. Before becoming a judge she worked as a prosecutor, a court-appointed and private criminal defense lawyer, and a guardian ad litem in dependency and neglect cases. She also served as a district court magistrate in the 18th Judicial District from 2005-2007. Judge Gonzales Mangnall previously presided in the municipal criminal division and currently presides over a traffic courtroom. Judge Angela R. Arkin, 18th Judicial District. A 1983 Emory Law School Graduate, Judge Arkin became a District Court magistrate in Arapahoe County with a domestic and juvenile docket in 2000. In 2002, she became a district judge and served in all four counties of the district, with dockets including criminal, civil, probate, mental health, juvenile and domestic cases. She is a frequent lecturer and author in the area of family law, DNA evidence and jurisdiction. James S. Casebolt served on the Colorado Court of Appeals for 21 years after being appointed by Governor Roy Romer in 1994, after nearly 20 years as a shareholder-partner with Younge and Hockensmith PC in Grand Junction, where he practiced civil litigation. He was the Deputy Chief Judge for the Appeals Court from 2005 to 2015. A University of Colorado School of Law graduate, Judge Casebolt was considered an expert on jury selection and authored “Civil Jury Selection and Pattern Voir Dire,” recommended for use in all Colorado trial Courts. He is a former chairman of Colorado’s Public Employees’ Retirement Association, which holds some $45 billion in assets. Gregory J. Hobbs, Jr. is a retired Colorado Supreme Court Justice who was appointed by Governor Romer in 1996. Prior to joining the court he practiced law for more than two decades with an emphasis on water, environment, land use and transportation. A 1971 University of California Berkeley School of Law graduate, he served with the Peace Corps in South America. He has been active in publications, presentations and community service and taught environmental law at the University of Denver.